A charming blog post, Walk Like an Egyptian, talks about the connection between novelist and travel writer Amelia B. Edwards and the development of modern Egyptology. The blog points out that women novelists and Egyptology go arm-in-arm. For instance, Agatha Christie (Death Comes as the End, Death on the Nile) and Elizabeth Peters (the Amelia Peabody novels) both spent time excavating along the banks of the Nile. 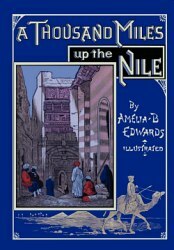 In fact, it’s clear that Elizabeth Peters’ Amelia Peabody is based on Amelia B. Edwards, and the action in the first Amelia Peabody book, Crocodile on the Sandbank is based on Edwards’ voyage as told in A Thousand Miles up the Nile. A Thousand Miles up the Nile is a leisurely and well-written narrative of her time in Egypt, detailing both the ancient monuments and the contemporary people she encountered. As with all Victorian travel writing, it’s a product of a vanished age. But in this case it’s a product of a vanished age talking about another, much older vanished age. The dual perspective casts intriguing shadows!